Who the Heck Is Wendy Wasserman Schultz? On Friday evening, President Donald J. Trump inadvertently referred to the disgraced Congresswoman Debbie Wasserman Schultz as "Wendy." In hysteria, the media and blue-check marked liberals on Twitter erupted with laughter as the tweet sat there for twenty minutes. President Trump finally deleted that mistake and replaced it with a tweet featuring her proper name. So what was the tweet? Was it something sexist? Was it a new 2020 campaign slogan? Perhaps it was a new nickname? No, it was not any of that. It was President Trump pointing out that Debbie Wasserman Schultz's malfeasant computer practice has put national security at risk. 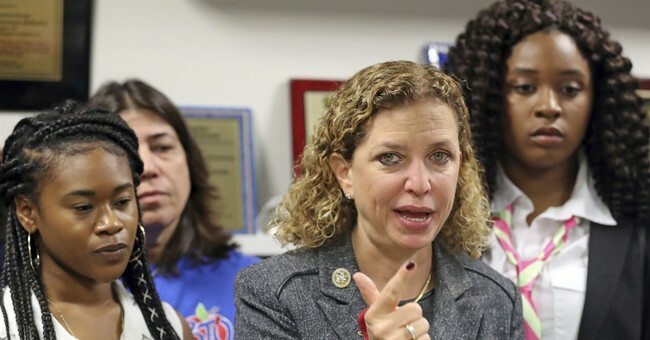 In fact, it is not only Rep. Wasserman Schultz, but dozens of House Democrats who have been negligent in their care for national security and important government information by hiring personnel who have not been properly vetted and may have potentially stolen very important information. If it seems like Rep. Wasserman Schultz has had zero media attention in recent memory, it is probably she has laid pretty low since resigning from serving as Chair of the Democratic National Committee. Did she resign because she served her time honorably and led the party to unprecedented heights? No, she resigned because she was caught favoring Hillary Clinton during the 2016 Democrat presidential primary. She made disparaging remarks against Democratic candidate Bernie Sanders in e-mails. "Former DNC Chair Debbie Wasserman Schultz resigned as chair of the DNC earlier this summer after hacked emails found her mocking Bernie Sanders and his campaign, proving she was anything but neutral during the Democratic primary. She faced pressure (and boos) from liberal progressive voters unhappy with the bias against Sanders, and the DNC seemed all to happy to usher her to the exit." So, does what President Trump is referring to have anything to do that with? No, President Trump is more likely than not referring to the absolutely stellar investigative work by Daily Caller reporter Luke Rosiak. For the better half of the last year, Rosiak has exposed more than 50 stories of security risk and data breaches made by one man and his family. Imran Awan, along side four other Pakistani nationals, have been accused of stealing equipment and data from House members offices as Democrat IT workers. Awan has been working for Wasserman Schultz in some capacity since 2005. He and his family were also hired by other Democrats. But more troubling is the fact that more than 40 of these House Democrats did not even give these workers the required background check. As Roziak told Fox News, parents give their baby sitters more of a vetting process than Democrats gave their IT personnel. The IT folks handle their computers, passwords, servers replete with government information ranging from public to classified, and much more. Bad people can do a lot of damage with this information. And it looks like that is what happened here. All of this has a lot of suspicious twists and turns, but the evidence is pretty damming against the Awan clan. Awan's wife abruptly left the country in the middle of the investigation. Awan himself was arrested in the airport trying to flee the country. But, the case is truly bizarre all over. "A criminal suspect in an investigation into a major security breach on the House of Representatives computer network has abruptly left the country and gone to Pakistan, where her family has significant assets and VIP-level protection, a relative and others told The Daily Caller News Foundation’s Investigative Group. Hina Alvi, her husband Imran Awan, and his brothers Abid and Jamal were highly paid shared IT administrators working for multiple House Democrats until their access to congressional IT systems was terminated Feb. 2 as a result of the investigation. Capitol Police confirmed the investigation is ongoing, but no arrests have been reported in the case. Their positions gave them access to members’ emails and confidential files. In addition, Imran was given the password for an iPad used by then-Democratic National Committee Chairwoman Debbie Wasserman Schultz, a Florida Democrat. The five came to the U.S. from Pakistan." Rosiak's investigative work continued throughout the year. In the beginning of 2018, the House concluded that these five Pakistani nationals indeed had unauthorized access to Democratic servers. "House investigators concluded that Democratic IT aides made unauthorized access to congressional servers in 2016, allegedly accessing the data of members for whom they did not work, logging in as members of Congress themselves, and covering their tracks, according to a presentation summarizing the findings of a four-month internal probe. When acting on the findings, Democratic leadership appear to have misrepresented the issue to their own members as solely a matter of theft, a comparison of the investigators’ findings with Democrats’ recollections and a committee’s public statement shows, leading 44 Democrats to not conduct protective measures typically taken after a breach — including informing constituents whose personal information may have been exposed. (A list of the involved members is below.)" As Rosiak notes, this was wholly inappropriate. "There is no scenario where the access was appropriate because House members are not allowed to accept services from people not on their payroll and employees are not permitted to log in to servers of members for whom they do not work. The presentation notes that such House polices are codified in law." Rosiak and the Daily Caller News Foundation team have been virtually the only investigative media outlet covering this story. The details of this story are very difficult to compile in one online article. But, after compiling dozens of articles and key areas of concerns, here at the top 15 things Rosiak says the public should know about the "Pakistani mystery man." 6. After Imran was banned from the network, he left a laptop with the username RepDWS in a phone booth. So, while the rest of the media is yukking it up because President Trump called Rep. Debbie Wasserman Schultz by the wrong name, Rosiak and his team of relentless truth pursuers have been actually, you know, doing their jobs. With such a weird and troubling case, why are liberals spending their time making fun of Trump? Where are their questions for these House Democrats? "Who the heck is Wendy Wasserman Schultz?" That does not matter. Americans should be asking, "Who the heck is Imran Awan?" Here's a segment featuring Luke Roziak on Fox News explaining the entire situation in more detail.